Silly Mommy : "I lost my tooth, Mom!" When I picked Aubrey up from school yesterday, she smiled a new toothless smile and said, "I lost my tooth, Mom!" 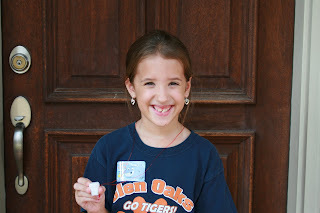 This was her very first tooth to lose, so she was so excited! 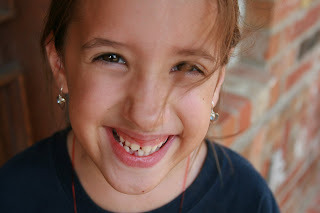 She had even wanted to lose it at school because if you do, you get to go to the nurse's office and get a necklace that has a tooth-shaped tooth holder. The nurse also gave her a sticker to wear. She was beaming all afternoon and evening. She has been waiting and waiting to lose a tooth and finally, she did! Her new smile! If you look closely, the new tooth is actually already growing in! 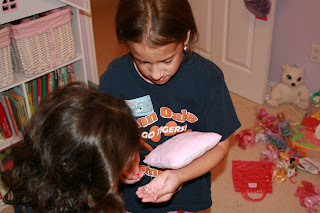 Carefully placing her tooth in her "Tooth Fairy Pillow" as Ella excitedly watches. This morning-SCORE! 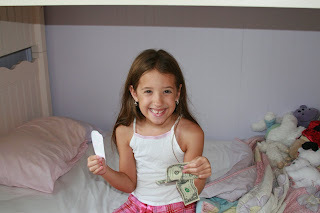 The tooth fairy decided to be extra nice to Aubrey and left her $2 since it was her first tooth. Aubrey was shocked! The tooth fairy also left a note stating what the tooth rate was for her(so she knows what to expect from here on out). The note said, "Congratulations Aubrey! 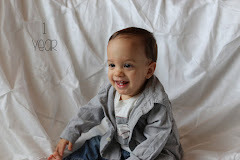 $2 for the first tooth, $1 for each additional tooth. Love, The Tooth Fairy." Yea Aubrey! We're so happy you finally lost your tooth. Great job at wiggling it! This morning, after Aubrey had found her money under her pillow, she took one of her dollars, wrote a note, and stuck it under Ella's pillow. Could Aubrey be any sweeter? It just melted my heart. I have the sweetest girls ever! Ella was so happy. If you can't read it, it says, "Dear, Ella I just want you to fill good. Love, Aubrey." 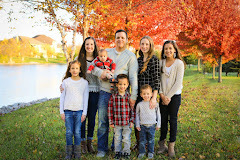 Its moments like these that make parenthood the best. How sweet, I almost about cried. You've taught your girls well, good job Holly. And yay for Aubrey on losing her first tooth; I remember what that was like. What a sweet example of unselfishness!! I'm sure Aubrey will have fond memories of this for a long time. I'm glad her school made her feel so special! We love you Aubrey!! Awww... what a sweet girl you have. Congrats to Aubrey for losing her first tooth! Aubrey is such a sweet sister! Yay Aubrey for losing your first tooth. 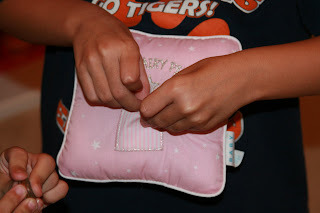 Your tooth fairy pillow is sooo cute. I love you to grandma!!!!! !And thanks for posting about me mom! Awwww, so sweet. What a cute story! First lost tooth is sooo exciting! Yea for Aubrey! Holly, it looks like you and your family have had a lot of exciting things happen. That's cool about Joey's heroic efforts. And I just read that you are expecting. CONGRATULATIONS!!!!!!! Addyson has already lost 6 teeth and she wanted to loose one at school so bad so she could get the tooth holder and necklace and it just never happened the way she wanted it to- Aubrey is lucky! What a great sister too, don't you just love it when they are so considerate of each other, those are moments that just make your heart melt. Aubrey is the sweetest little girl! I can only hope Savy is as thoughtful and nice to her younger siblings as Aubrey is. Way to go on losing your first tooth! I think you have the best girls ever. You touch my heart every time you write. I am sending big hugs across the ocean and most of America to you and your lovely family! Happy Day to you! Holly wanted to sneek in a Happy Birthday here for you as well. Happy Birthday today since I didn't comment yesterday. We love you and hope your day is going great. 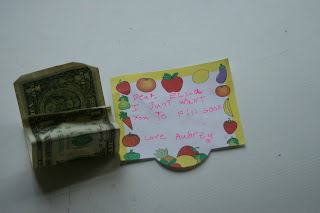 i guess the toothfairy follows inflation...i used to get a quarter :) aubrey, you are so sweet! that's so nice to think of you little sis! 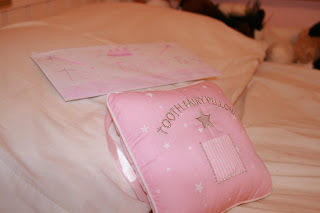 That tooth fairy pillow is so darling. Where did you get it? Congrats Aubrey!! I am not looking forward to my kids losing their teeth. When they get all hangy and are constantly being wiggled by fingers and tongues....it totally grosses me out. WTG! and the note to ella is beyond cute.